Can I use kickstand4u™ on phones that already have built in kickstands? Yes, kickstand4u™ mobile smartphone kickstand with Sure Grip™ (Patent Pending) can be used on just about any device that has a flat surface. Can be used on devices with or without a case and is easily removable and transferable to another device if needed. Most of the time when using kickstand4u™ mobile kickstand on a phone with a built-in kickstand, you will gain more versatility and adjust-ability. The advantage of kickstand4u™ mobile kickstand in this situation, is that it will provide a very stable and adjustable (See Diagrams C) Portrait or Landscape angles over mobile phones that have a factory one position Landscape only kickstand option. Another advantage of kickstand4u™ mobile smartphone kickstand, is that you can flip your device 180 degrees as an alternate Landscape position giving instant access to side mounted charging ports. And with the Sure Grip™ technology, it allows for a comfortable secure drop free hand grip experience if needed. Can I use kickstand4u™ mobile smartphone kickstand on small tablets and e-readers? Yes, although designed for mobile phones, kickstand4u™ mobile kickstand can be used on just about any device that has a flat surface. The 7" size tablets work perfect with the kickstand4u™ mobile kickstand. Can I use kickstand4u™ mobile kickstand on larger tablets like the iPad and same larger sized Android tablets? Yes, although designed for mobile phones, kickstand4u™ mobile kickstand can be used on just about any device that has a flat surface. On the 10" size and heavier tablets, one kickstand4u™ mobile smartphone kickstand will work very well. If the tablet is using a very heavy external case, then two kickstands may be needed for more stability. And it's only 1/8th inch thick. It can be installed inside or outside a case. 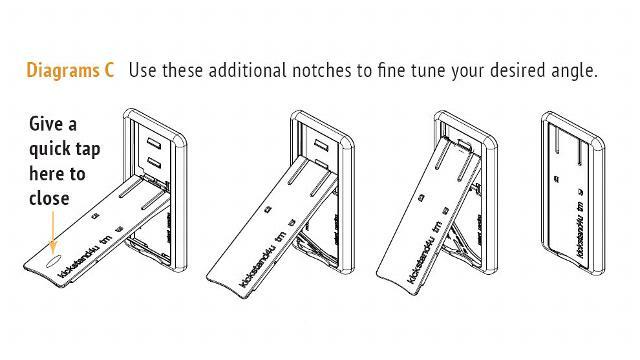 Why else would I want to use a kickstand4u™ smartphone kickstand? 7) Your kickstand doesn't provide you with a comfortable viewing angle. What if my phone or tablet's battery case is not completely flat? Certain phone models from both Samsung Galaxy Series and Motorola may have a small "chin" at the bottom of the battery cover should mount kickstand4u™ right above that area and centered. Slight curved backs like the Galaxy Nexus and some small tablets should not pose a problem either. My phone's battery cover or my preferred case is a 2 piece split system, what should I do? In this instance, phones or add on protective cases that have a back cover that are split right where kickstand4u™ smartphone kickstand needs to be attached, if so, you can leave the protective release paper on where you don't want it to stick, and stick to the remaining half. This should work because mobile cell phones are so light that the adhesive that is sticking to the remaining section of your device is most likely all the stick you will need. Can I remove and use my kickstand4u™ smartphone kickstand and install it on a different mobile device or use it for anything that needs to be propped up? 1) if you are using the optional 3M Command Strip system, simply pull the small tab at the bottom of the kickstand for an easy 5 second removal without leaving any residue. 2) if you are using the "standard adhesive", then you will have to pry the edges of the kickstand4u™ smartphone kickstand with a dull, thin object such as a butter knife - be careful not to scratch your case. See this video for helpful tips. Also using a a hair dryer to warm the adhesive a little will also help. 3) if you are using the "standard adhesive", then you can try dental floss underneath the kickstand4u™ mobile device kickstand and a slow gentle lift or use a see-sawing action to cut the adhesive and lift it off. Our kickstand4u™ mobile cellphone kickstand can be ordered with the optional 3M Command Strip system that does not cause damage to the attached surface when removed or leave any residue. Extra 3M Command adhesive is available directly from us if you cannot find it locally or online. The advantage is that it is simple to remove that will take about 5 seconds, easily allowing you to move the kickstand4u™ mobile smartphone kickstand from device to device, but you will have a small tab showing. If you think that you you want the more permanent "look", or simply don't like the look of the external tab, you can simply cut off the "pull tab" before you install, or if you are undecided, you can cut the tab off later.